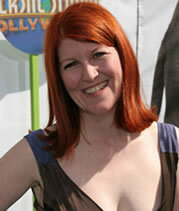 THE OFFICE’S resident lush, Kate Flannery, just posted a new TV Guide blog. I don’t know about you, but the thought that new episodes of THE OFFICE are less than a month away is really blowing my mind. Don’t you miss our friends at Dunder Mifflin? Kate’s blog brought me to my happy place – just knowing the cast is back at work makes me think all is right with this world. She’s got updates on Angela’s belly, a few thoughts on the first episode back, and what it’s like to be back at the office…um, work. Oh and by the way, she’s not kidding about the LEATHERHEADS billboards all over town. I’m staying on Sunset in West Hollywood and I can’t drive 2 feet without seeing Krasinki and Clooney staring back at me. How annoying!! Go check out Kate’s blog and make sure you leave her a comment to show the love. She definitely reads them all. Ok, is it totally embarrassing that the promo literally made me all teary-eyed? And is it wrong that I was praying for some small hint of Jam-ness in the promo to tide me over until April 10th? I love this show!!! I love how the promo says that “Thursdays are right again.” I totally agree – although Lost has been tiding me over during the past few weeks, I definitely have been missing our Office folks on Thursdays! And I’m also glad that Lost won’t be on the same time as The Office once both are back in April. I’m so excited that we’ve only got a few more weeks to go!